Now, for those of you’d like to know more, let’s explain all new features in detail. You can now post an item at up to 4 different locations. HOME. Our research has shown that most of our Swapit users do use Swapit at their home and post items which are located at their home. So this can be clarified now. At the same time, many of our Swapit users do work at a place which is further away from their home. WORK. For several smaller items (e.g. fashion products, consumer electronics, etc. ), people are willing to bring them to their work place and trade them their — say, during their lunch break. So when posting an item, it is now possible to just flip on the work location and offer your item there as well. MEETUP. Many people commute from their home to work every day and usually they take the same route and the same mode of transport. So we thought, it might make a lot of sense to be able to define a certain “meetup location” which can be set freely by the user. In most cases, we believe, this will be an MTR station somewhere across town. All three HOME, WORK and MEETUP locations are user-specific because those usually don’t change often and if they change, they should take an effect on the user’s items. This means, that they are set and remembered in the user’s account. Once either of the locations is changed, all items using that location, will be updated automatically. OTHER. On top of the three user-specific locations HOME, WORK and MEETUP, we also introduce an item-specific location which we call “Other”. In many cases such an item-specific location makes sense. Think of properties, cars or yachts for example. If you publish such items on Swapit, you might want to actually show their location on Swapit. Let’s take a property: When you post a property for sale with the actual property’s location, Swapit will let people nearby that property know, that you are selling a property that’s nearby their location. Swapit is a very location-driven service. Our core has always been to bring buyers and sellers together who are nearby each other; in real-time. Up until the last release of Swapit, each location had exactly one location and when an item was posted, everyone nearby the sellers actual location at that moment, was notified that a new item is available. 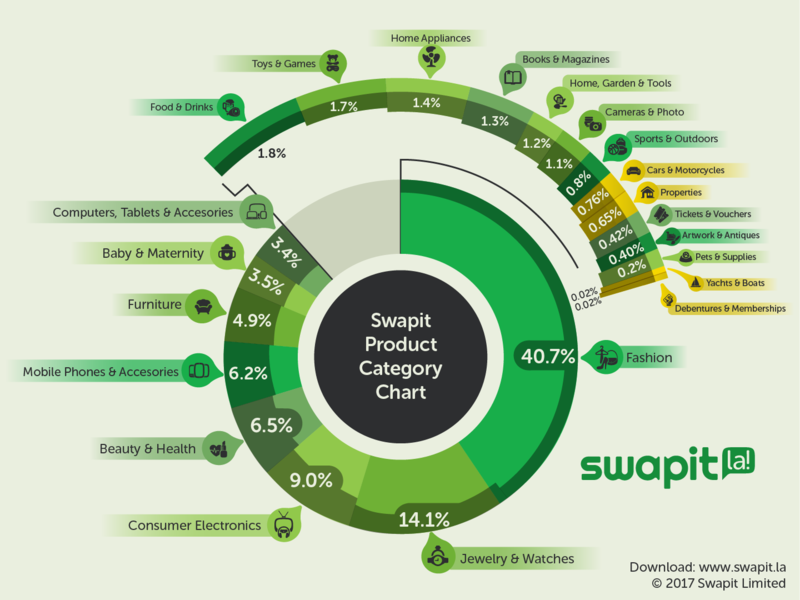 Swapit is now the world’s first marketplace that introduces multi-location for items and people. This now means, that each item can be published at up to 4 different locations (see above) which means, Swapit can reach 4 times more people than before. Thus, it increases the chances for an item to be discovered by an interested buyer, by 4 times. At the same time, each user can have his own home, work and meetup location stored in his user settings. Besides that, (s)he also has a current-location which constantly changes. That makes a total of 4 more locations, Swapit can use to match buyers and sellers. So in turn, Swapit’s reach based purely on location has increased by 16 times (4×4). In a nutshell: Our latest multi-location feature, increases the chances to close a trade by 16 times compared to our previous versions and especially compared to what our competitors are offering. Sometimes, you see an item someone posts on Swapit and you just like it. You’re not really interested in buying it right now, but you do somehow find it interesting. Or perhaps you just find it absolutely cool that someone posts this sun tanning tower. To give you a tool to show that you like an item, you can now just hit the LIKE button. It is available in the list of products that shows up at the launch of Swapit as well as in each item’s detail view. Besides publicly showing that someone likes that item, Swapit does not publish the name of the person who liked the item. That is not shown to the seller nor to other buyers. We might actually change that in future, but as of now, this is how it is. When liking an item, you do also subscribe to updates about that particular item. So if someone leaves a comment there or if the item is being sold, you will get a notification so you can check out any changes made there. At any time you can just unlike the item or turn off notifications for that item, in the item’s menu at the top right corner. We believe this is a very convenient way to show your interest in an item even though, you’re actually not looking to buy it, right now. Perhaps at some point in time, you might be willing to buy it and therefore, it is now very convenient to just keep track of an item’s changes. In our last beta release, we introduced chat snippets. These are small pre-defined texts which you can use while chatting. Our first set of snippets was geared towards making it easier for buyers to communicate. Now, we have added another set of snippets just for sellers. It includes common phrases like “The price is fix.” or “Make me an offer.”. If you’d like find out more about seller snippets, just go to Swapit and post an item for sale. Once you are in a chat as a seller of an item, you’ll be seeing the seller snippets right next to your chat input field. Swapit is now tracking the number of views and visitors to an item. Users need to have the latest Swapit version installed for views and visitors to be tracked. Hence, if someone with an old version views your item, Swapit doesn’t track that view. So for a short little while – until everyone has upgraded to the latest Swapit version – the view and visitor numbers might understate the actual number of views and visitors. A view is being tracked each time any user views your item. A visitor is being tracked only the first a user views your item. Both numbers can be very important for the seller. For example, say you have 50 views, but only 2 visitors, then you know that 2 people have your item 50 times in total. If you still haven’t sold your item or no one attempted to buy it, you should know that something is wrong with your item’s presentation. Perhaps the description is not well formed, perhaps the photos are too low in quality, the price is too high, or there is something else. It is always good to check out our Tips for Making a Sale series which gives you practical tips on selling your item faster. It is now possible to select multiple pictures from your photo gallery at once. This was one of the most-wanted features ever. We do constantly conduct surveys with our users and during those surveys we usually have a list of upcoming features we’d like people to rank in terms of importance to them. This helps us a lot in prioritizing our release roadmap to ensure, we are bringing features our users are looking for, as soon as possible. While we can’t do all at once, we try to get as much done as possible. We want to make our users and ensure we create the right product for the right people, with the right set of features that makes everyone’s life easier.